The sharp decline in the rupee this month has sent shock waves through the financial markets. The fall has been accentuated by statements from senior policymakers that the Reserve Bank of India (RBI) does not have the firepower to aggressively defend the Indian currency. Second, huge intervention involving selling of dollars to buy rupees will worsen the liquidity crunch in the domestic money market. Banks have been borrowing around ₹ 1 trillion from the repo window in recent weeks; the liquidity deficit is almost twice as large as what RBI would like to maintain. The gap will widen in case there is a huge operation to defend the rupee, which means that domestic interest rates could spike at a time when the economy is slowing, as well as raise borrowing costs for the government. The falling import cover and the domestic liquidity crunch make heavy RBI intervention unlikely, though critics are quite justified in asking whether policymakers should have explicitly signalled their unwillingness to aggressively defend the rupee. This does not mean that India is slouching towards a 1991-style balance of payments crisis. Take one very simple parameter: the so-called Guidotti-Greenspan rule. It is named after former Argentine finance minister Pablo Guidotti and former US Federal Reserve chairman Alan Greenspan. 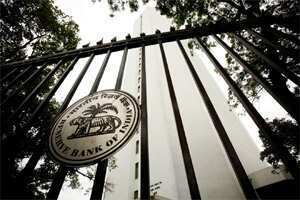 They suggest that reserves should be equal to short-term external debt. In other words, a country should be able to cover a sudden withdrawal of short-term capital that could tip it over into a crisis. India’s short-term dollar liabilities have shot up in recent years, and were $65 billion at the end of March. That is barely one-fifth of our foreign exchange reserves. India is more than capable of dealing with a sudden outflow of capital right now. In 1991, India had an import cover of less than two months. Short-term debt was higher than the total foreign exchange reserves held by the central bank. The crisis of 1991 was inevitable. The fundamentals are far stronger right now, though what RBI says in its forthcoming financial stability report on the external account will be worth reading. However, the strain could increase in case the next year is worse than the current one. A major global shock and heightened risk aversion could put stress on the external sector. Consider a hybrid parameter: the addition of the combined fiscal deficit of the Union and state governments, and the current account deficit. These twin deficits are often used as indicators of the underlying strength of an economy, and its ability to manage turbulence. The cumulative deficit in FY11 could be above 12% of gross domestic product, similar to the level in FY11 and, importantly, close to the crisis-level peak reached in FY1991. The deterioration in the twin deficit since the financial crisis of 2008 is particularly steep. This deterioration (along with the rise in inflation) is a sign of excess domestic demand. The Manmohan Singh government has stimulated consumption without introducing the reforms needed for a robust supply response. At the root of the problem is the political strategy of the United Progressive Alliance, a point this column made a fortnight ago. 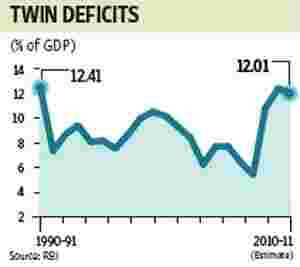 The sharp rise in the twin deficit suggests that India is far more vulnerable to a global shock today than it was in the gut-wrenching aftermath of the collapse of Lehman Brothers. A growing economy can manage both a fiscal deficit and a current account deficit, or borrowing from local and foreign investors to finance growth. The problem is that these deficits should not grow to a level that puts the economy at risk in bad times. India is nowhere near a balance of payments crisis just now, but it clearly does not have adequate firepower to deal with the consequences of a global shock. The fall in the rupee in recent weeks is an advance warning.